Do you want to manage your own retail shop premises? 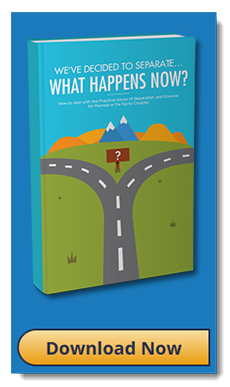 Not sure where to begin? 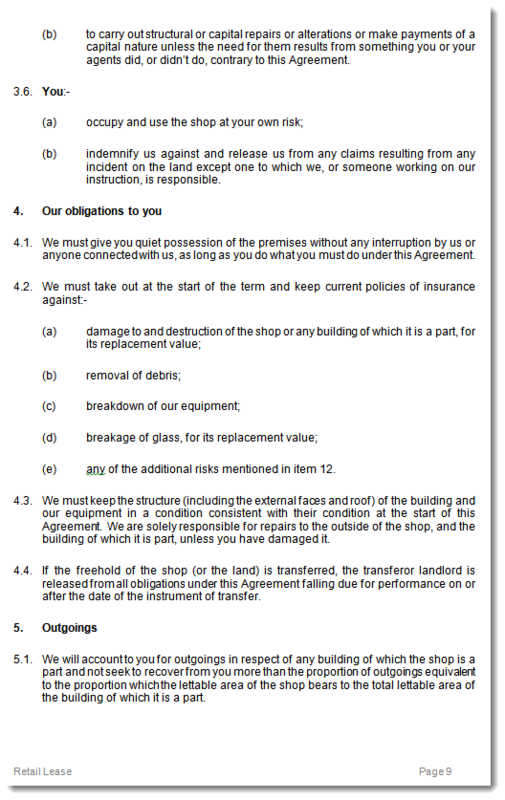 Our Retail Lease Agreement kits are just the ticket to get you started and guide you to a successful retail tenancy. 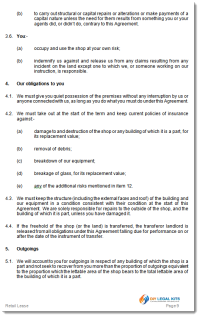 When a landlord (the lessor) offers retail shop premises to a tenant (the lessee) s/he needs more than just a handshake to comply with the retail tenancy laws. 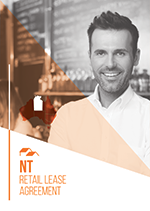 Each Australian state and territory has developed retail tenancy legislation to ensure fairness in the dealings between landlords and tenants. 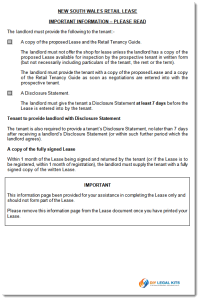 A landlord in a retail lease must not, in connection with the lease, engage in conduct that that is misleading or deceptive to a tenant or guarantor. 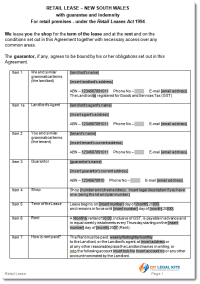 A party who suffers damage by reason of misleading or deceptive conduct of another party may make a claim for compensation. Our Retail Leasing kits guide you every step of the way by providing all the information and documentation you need to ensure you navigate the law with ease. 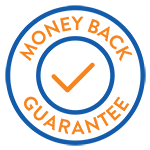 save heaps on management and legal fees. 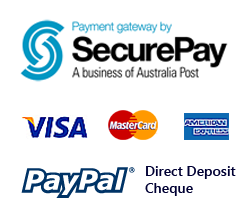 Our fully secured e-commerce system allows you to purchase and download your kit safely. Simply click on the state or territory you require. 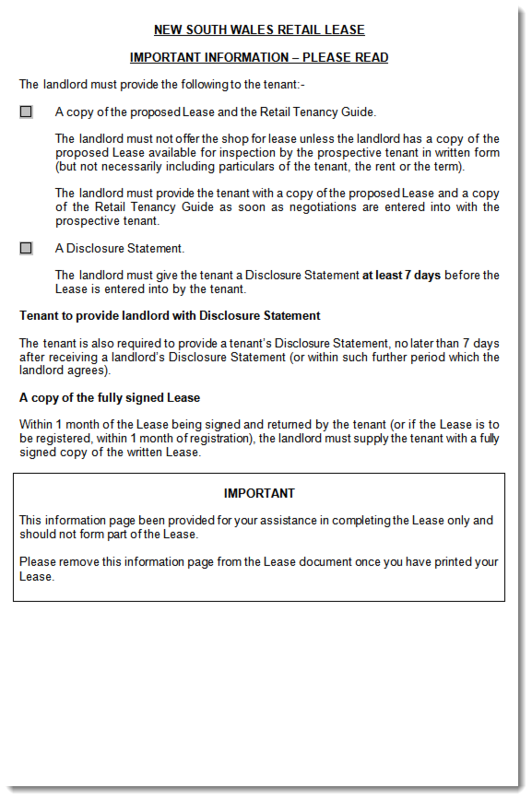 In just a few minutes you can have everything you need to manage the rental of your retail premises and protect the interests of all the parties involved. 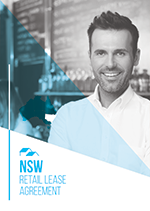 Includes the NSW (New South Wales) Lease Agreement (doc) template, NSW Disclosure statement, Sample disclosure statement and Retail lease, Easy to follow help guide, Getting Started document and Friendly customer support. 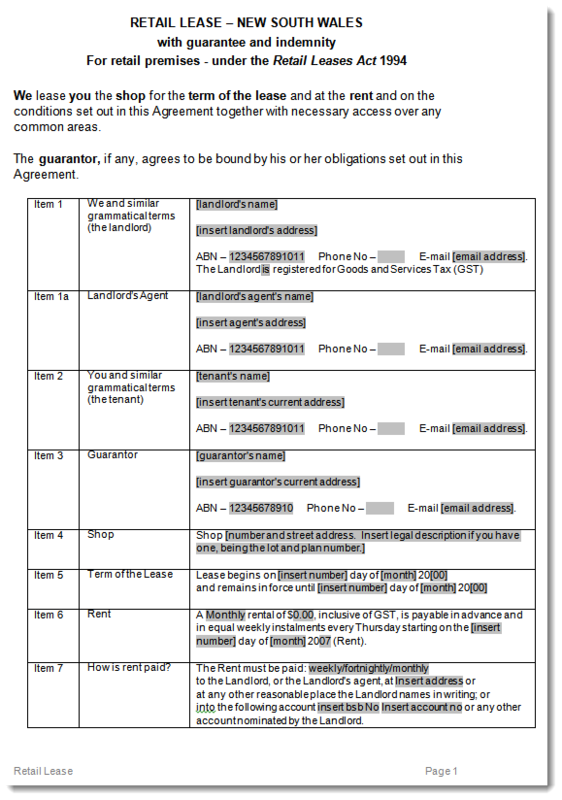 Includes the NT (Northern Territory) Lease Agreement (doc) template, NT Disclosure statement, Sample disclosure statement and Retail lease, Easy to follow help guide, Getting Started document and Friendly customer support. 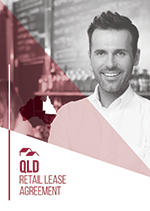 Includes the QLD (Queensland) Lease Agreement (doc) template, QLD Disclosure statement, Sample disclosure statement and Retail lease, Easy to follow help guide, Getting Started document and Friendly customer support. 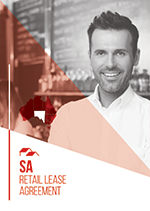 Includes the SA (South Australia) Lease Agreement (doc) template, SA Disclosure statement, Sample disclosure statement and Retail lease, Easy to follow help guide, Getting Started document and Friendly customer support. Includes the TAS (Tasmanian) Lease Agreement (doc) template, TAS Disclosure statement, Sample disclosure statement and Retail lease, Easy to follow help guide, Getting Started document and Friendly customer support. Includes the VIC (Victorian) Lease Agreement (doc) template, VIC Disclosure statement, Sample disclosure statement and Retail lease, Easy to follow help guide, Getting Started document and Friendly customer support. 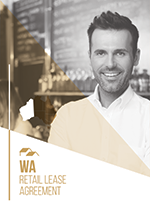 Includes the WA (Western Australian) Lease Agreement (doc) template, WA Disclosure statement, Sample disclosure statement and Retail lease, Easy to follow help guide, Getting Started document and Friendly customer support.